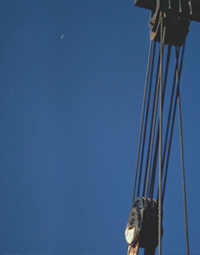 Compac® 6; High-strength 6-strand Crane Rope (HiPac™ Compacted) - Unirope Ltd.
Compac® is recommended for heavy use or where conditions are abusive and/or abrasive. Overhead cranes, crawler cranes, lattice boom cranes, truck crane rope, multipart hoist lines where rotation resistant ropes are NOT required. Because of it's very good crush resistance 6-strand COMPAC® is particularly recommended for use on multi-layer drum application. 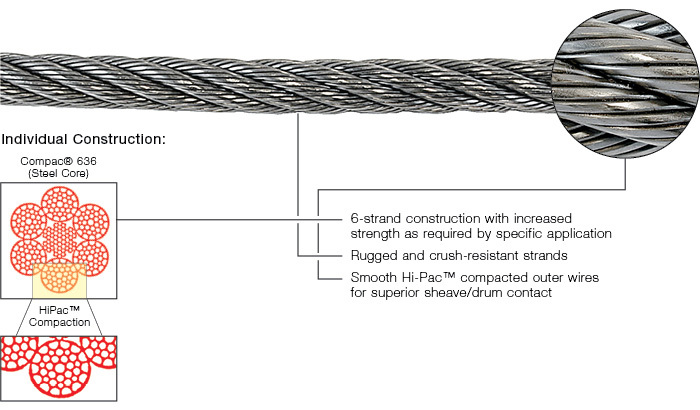 Hi-Pac™ strand surface minimizes inter strand- and inter layer nicking that takes place in standard 6-strand ropes. 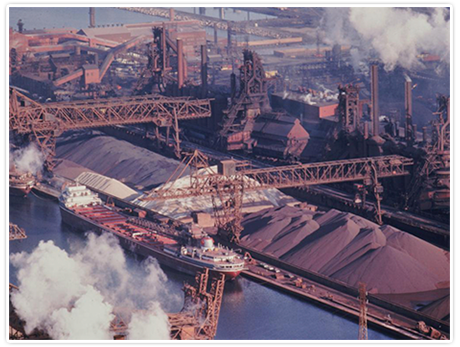 The COMPAC® design provides excellent abrasion and crush resistance. Abrasion resistance is enhanced because of the increased wire and strand surfaces contacting sheaves and drums. When used in multilayer drum winding operations COMPAC® greatly reduces damage at the crossover points from one rope wrap to the next. Compac® 6 type ropes are NOT rotation resistant or non-rotating. Do NOT use Compac® 6-strand wire rope attached to a swivel. The rope WILL unlay resulting in an unsafe condition. Block Twisting (Cabling) will occur when used exceeding certain lifting heights. Call for advice. Recommended for heavy use or where conditions require a crush resistant rope for multilayer drums. Used as main hoist and boom hoist rope on mobile, tower and crawler cranes, and as main and auxiliary load line on overhead cranes.